I hope you had the most beautiful weekend, I had a busy one with a couple shows, and teaching my glamorous Vintage Pinup Workshop. Recently Stan added a rather fabulous documentary titled “Bombshell” on the life and glamour of one of my favourite vintage stars, Hedy Lamarr. She’s someone I’ve featured on many occasions on my blog and I couldn’t resist sharing her again today for my Monday Morning Glamour post. In the documentary you hear a recording at the end of the film which really resonated with myself, and I think her words are so very powerful. If you haven’t watched Bombshell on Stan, I would highly recommend it. 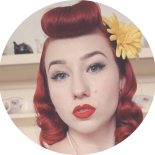 This entry was posted on February 11, 2019 by Miss Lady Lace in Monday Morning Glamour and tagged 1940's, 1950's, blogger, glamour, miss lady lace, miss lady laces pinup blog, perth, perth pinup, perth pinup blog, perth pinup community, pin up, pinup, pinup blog, pinup blogger, pinup fashion, pinup girl, pinup life, pinup lifestyle, pinup perth, red lips, retro blog, retro girl, retro glamour, the perth pinup community, victory rolls, vintage, vintage blog, vintage blogger, vintage girl, vintage glamour, vintage perth, vintage pinup blog.